The Sikorsky S-58 was developed from the Sikorsky's UH-19 Chickasaw. The aircraft first flew on 8 March 1954. It was initially designated HSS-1 Seabat (in its anti-submarine configuration) and HUS-1 Seahorse (in its utility transport configuration) under the US Navy designation system for US Navy, US Marine Corps and US Coast Guard aircraft. Under the US Army's aircraft designation system, also used by the US Air Force, the helicopter was designated H-34. The US Army also applied the name Choctaw to the helicopter. 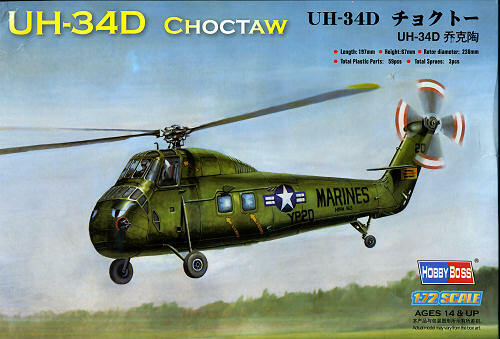 In 1962, under the new unified DoD aircraft designation system, the Seabat was redesignated SH-34, the Seahorse as the UH-34, and the Choctaw as the CH-34. A total of 135 H-34s were built in the U.S. and assembled by Sud-Aviation in France, 166 were produced under license in France by Sud-Aviation for the French Air Force, Navy and Army Aviation (ALAT). As widely used as the H-34 has been, prior to this kit there has been only conversions for the Matchbox or Frog Wessex until Italeri released the H-34 variant several years back. Not be outdone in its extremely rapid expansion of its product line, Hobby Boss now has added the Choctaw to its line-up. 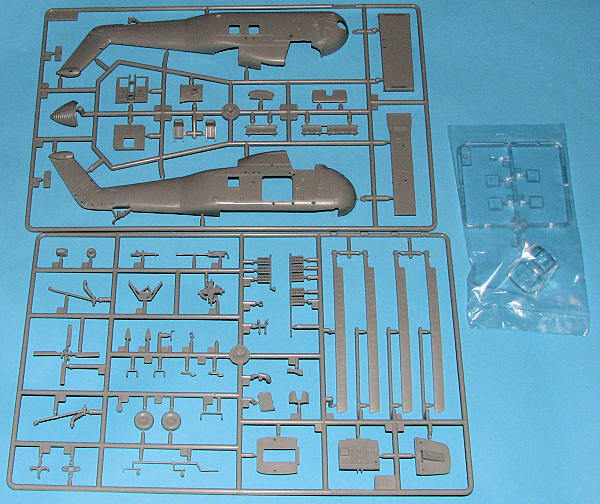 The kit's 59 pieces are on two very nicely molded grey sprues with one clear sprue. The clear parts have quite large frame lines for the main cockpit canopy so masking will not be an issue. The side windows are recessed to allow easy installation of the cabin windows. This kit is really a Vietnam combat kit as it includes what looks like a 20mm cannon for the cabin door. There is also a .50 cal machine gun that attaches to the side of the cabin. ( A reader has suggested that these may well be a .50 and a .30 cal weapon) The cockpit is well appointed but misses the collective so you'll have to add one out of sprue. The cabin has standard jump seats. The floor of the cabin piece is festooned with ejector pin marks. If you have the door open you will want to remove them. I appreciate that the rotor blades already have droop molded into them as my abilities to duplicate this have always proven to be less than satisfactory. The kit also comes with a rescue hoist and a quite sturdy looking landing gear. I should mention that the tail gear (minus wheel) is molded in place. Instructions are adequate with well done assembly drawings, but without any painting information for the cockpit or cabin. Hobby Boss really needs to address this as it is quite unsatisfactory. The markings and decal instructions are not color as in other kits, but provide Gunze paint references for the exterior. The box art aircraft is with HMM-161 and is in overall Field Green. The other option is a South Vietnamese plane in Olive Drab. 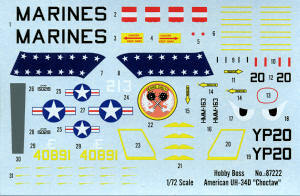 The decal sheet is well printed and provides tail rotor markings. I assume one paints the main rotor tips yellow and on the second markings option, there is a large yellow panel on the roof that will need painted. Decals are well printed though the US insignia has borders that are far too thin so one will need aftermarket for these. So there you have it. Another nice H-34 kit. It is better than the Italeri one? Difficult to say as that one is nice as well, however, you do not have to attach a separate nose with this one and it seems to be a bit easier to build. Regardless, it should make into a very nice model of an important helo.